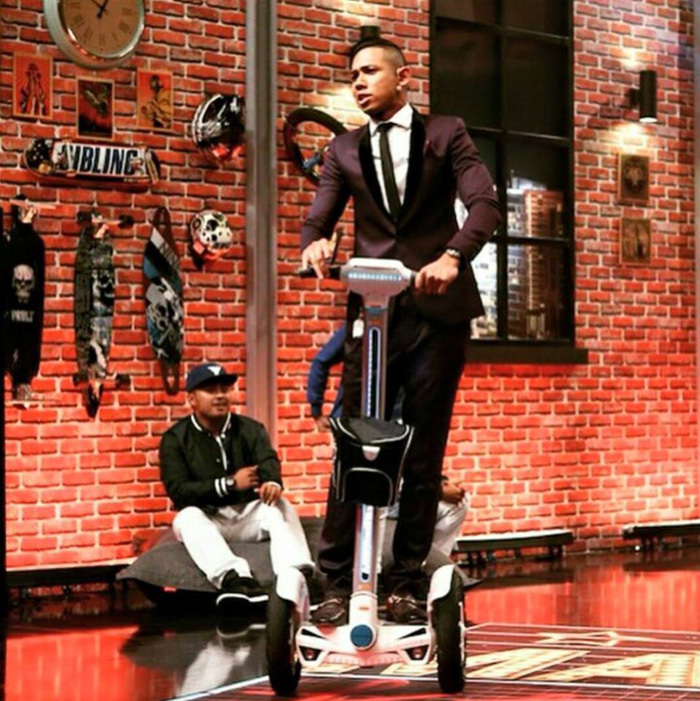 Recently, Airwheel successfully made a sensation in Malaysian as the host of Ini Malam Kita Punya, a talk show broadcasted every Friday night on Malaysia’s ASTRO Mustika HD channel, got on the stage by riding self balance electric unicycle but more agile device. Audience got thrilled when they saw the host doing many fancy postures on the device. This innovative and trendy device revealed on the Malaysia talk show is Airwheel S3, one of Airwheel's leading products that feature new concept of personal transportation and zero-emission. Unlike Airwheel's other models of self-balance unicycles, the S-series is a revolutionary intelligent electric scooter that features its platform. Riders barely need any balancing skills to get the basics of it and can be proficient with just a few tries. The standing platform is wide enough for all users to comfortably stand on, with the handlebar at a comfortable height for all users. The S3 model can cover an unrivalled range of 36-40 miles on a single battery charge, and is easy to use for all! All you have to do is to hold on to the handlebar and lean in the direction you wish to go! As the host excitedly remarked, Airwheel electric scooter is cool and efficient and brings about a new life style especially for commuters and hi-tech fans. Airwheel's products define the future commute concept. The sleek and smart exterior design catches everyone's eyes at first glance. 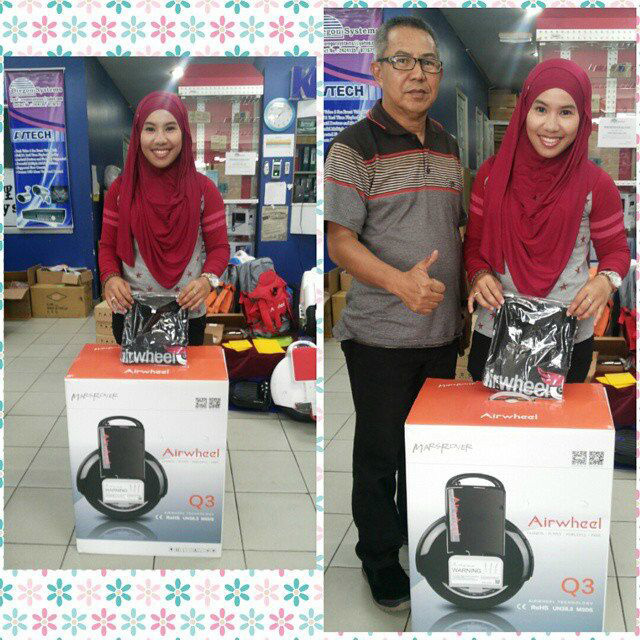 That’s why Airwheel products win favor by Malaysian citizens when the country endeavors to promote the “Car Free Morning”. The event starts at the first and third Sunday of each month with cycling, jogging, walking or even skating on major streets of Kuala Lumpur Golden Triangle along with thousands of others. It’s mooted by Kuala Lumpur mayor and introduced in January to promote a greener city and reduce global warming. Though traditional bicycles can be a zero-emission transporter, Airwheel obviously better caters the expectations of many commuters, as it is fun and fashionable in addition to efficient and eco-friendly. While urban commuters are spending hours getting stuck in the traffic, Airwheelers are getting around town freely. It can go as fast as bicycles do and save your energy at the same time. Moreover, it’s actually quite safe as Airwheel has a protection system. When Airwheel tilts at over 45 degree sideways, e.g. when it turns over, the control system will activate tilting protection. The motor will stall immediately to prevent injuries. Airwheel also sets a maximum speed. Take the S3 model for example, when speed exceeds 12km/h, the front end of the foot platform will rise gradually and when the speed exceeds 16km/h, the foot platform will stop you from inclining further to accelerate.